Well, Spicy is having her (nearly) weekly slumber party at Mimi & Bapa’s house (I’m so spoiled!) It’s so clear that she has such a very very special bond with her grandparents. I think the fact that Mimi took care of her 3 days a week for nearly 2 years has something to do with it. And the fact that we practically lived with Mimi & Bapa for a year during Daddy’s deployment. She was so excited to hop into Mimi’s “limo”, request her special DVD (& juice cocktail) and wave “goodbye mommy. I see you tomorrow!” When Dean called her today on his lunch break, he said she sounded SO happy! I wonder why. So… He must’ve known about our ‘free night’ because a good friend invited us over to His house tonight. I told Dean despite the many other things we could’ve done (take a walk together, enjoy a long quiet dinner, watch a movie, etc etc) which were very tempting , we could not decline. His name is Jesus. God. I’m sure you’ve heard of Him? 😉 We went to visit Him in Eucharistic Adoration. On the way there, Dean and I had a wonderful conversation surrounding this highly debated, highly misunderstood, mysterious reality. It started with my questions (of course) which led to discussions on metaphysics and philosophical terms such as substance and accidents which led to a brief dialogue on the Hidden God leading to 1 of CS Lewis’s masterpiece, “Till We Have Faces” which concluded on an exchange on what is True Love? Although my experience was nothing more than “Be still and know that I am God” (Psalm 46:10), (afterall, I did have a wiggly baby in my lap) the reverence, the holiness, the grace and the peace was, of course, (& always is) overflowing. Our special date night very much reminded me of our courting days when we would do the same as we discerned God’s plan for our relationship. This is an ah-mazing post on the topic of ‘adoration’ from an great writer. 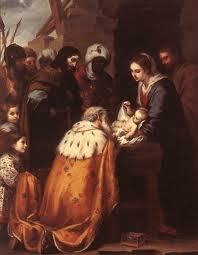 I came across it a few days ago which actually sparked my desire for such holy time. It’s a must read if you have ever wondered what? how? why? I just couldn’t have said it better myself. Good date night and I like the post (just what we were talking about the other day)! I hopped on over to that girls blog and although I dont know what some of the words mean (ie Eucharist Adoration or adoration church or something), I very much enjoyed her "about me" and find it awesome that she went from being an atheist to being a believer! God IS amazing!! 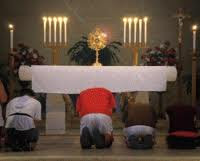 Care – Eucharistic Adoration is simply adoring (loving, worshiping, glorifying) God, the Living Christ – body, blood, soul and divinity in the "Eucharist" (= in form of bread). Adoration chapel is just a church where you can do that. (which is ANY catholic church) because the Lord is present either in the tabernacle (= dwelling place which looks like a box) or exposed on the altar. Hope that helps clarify!